Asking from northeast New Jersey. Sorry I couldn't get a better picture of it - I'm hoping this is enough to identify it. 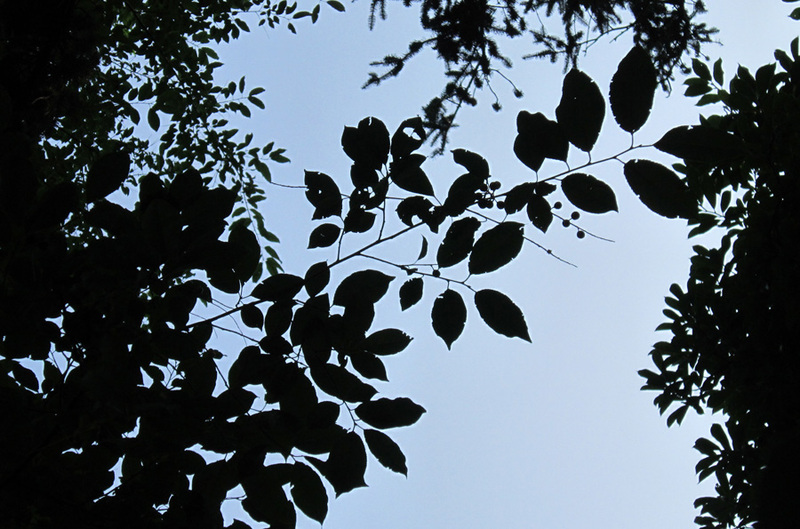 These pictures were taken from below the tree branches. The tree is in the front yard, is a little taller than the one-story house it's in front of and I think is wider than it is tall (hard to tell because a portion of it is getting crowded out by a large pine tree). 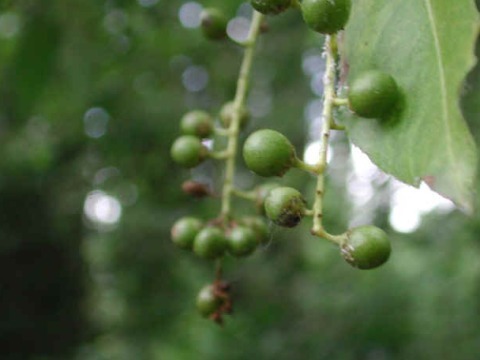 It currently has small round berries growing on it that are various shades of green and yellow at the moment. 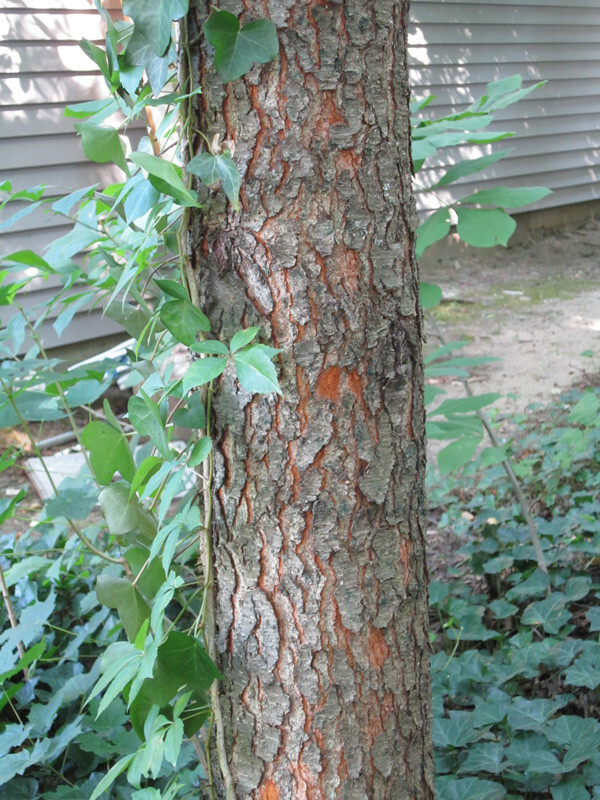 EDIT: Here are pictures of the bark and trunk as well as the top of the tree. 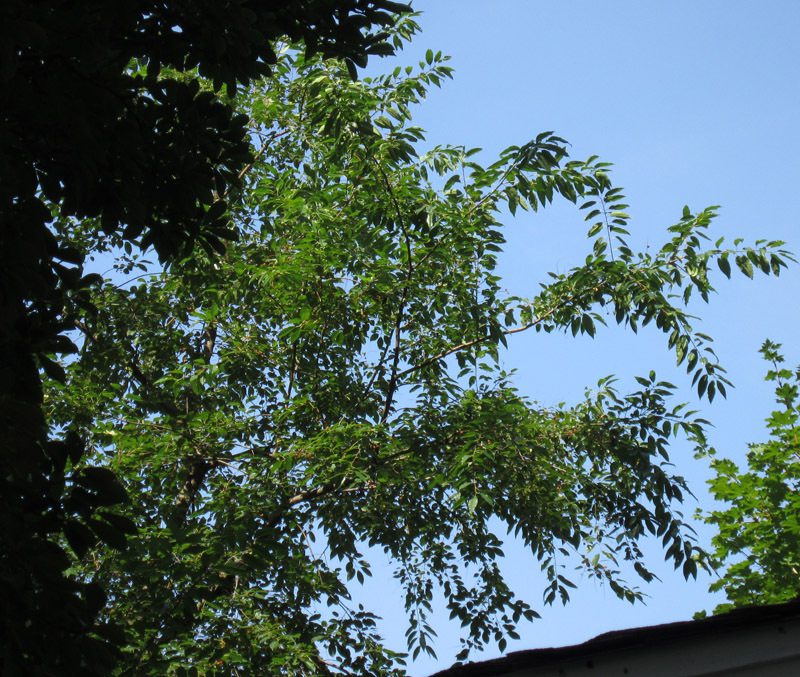 When I went out to take these new pictures, I realized this isn't the tree I thought I was talking about - this particular tree is growing next to the side of the house, and there appears to be an identical one growing right next to it. 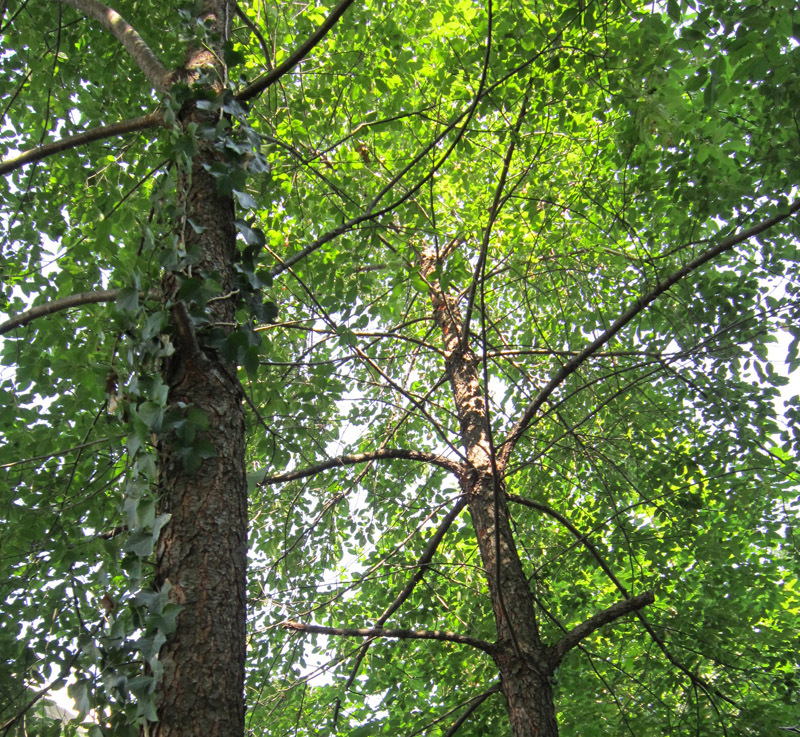 It has some ivy and virginia creeper climbing on it as you will see. 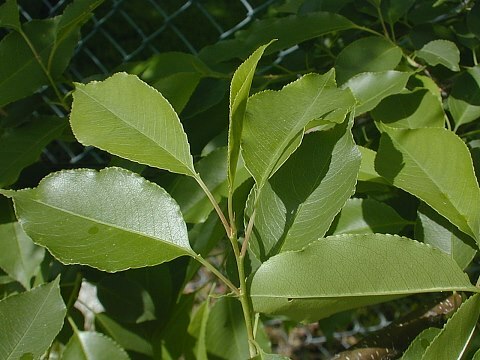 It's a wild black cherry, Prunus serotina. 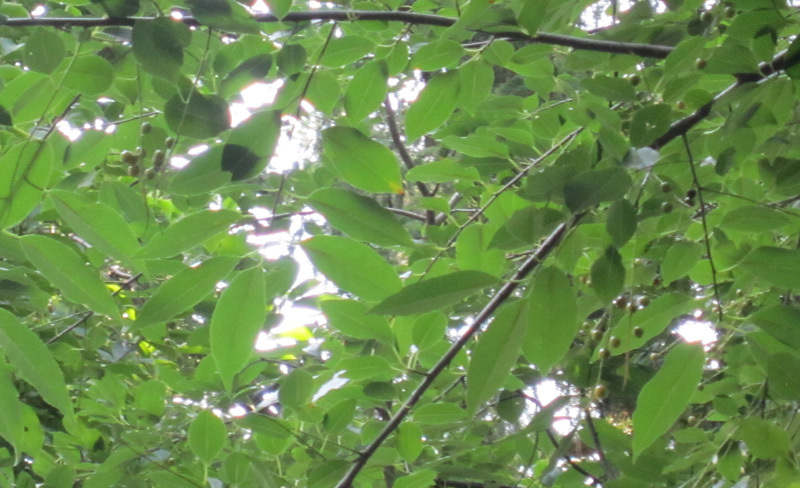 I recognized it at once from the bark, and then the cherries and leaves. I have more of these on my property than all the other tree species combined. 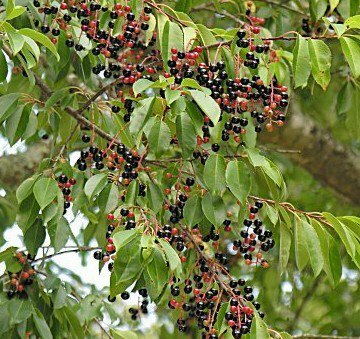 It is not a good tree for near houses, as it drops tons of small staining fruit (poisonous in large quantities), and also quite a few sticks. I also find that the roots aren't very supportive, and large ones tend to blow over in hurricanes and such. The wood is quite tough, although it rots fast. It is good for furniture, because it is durable and well colored. 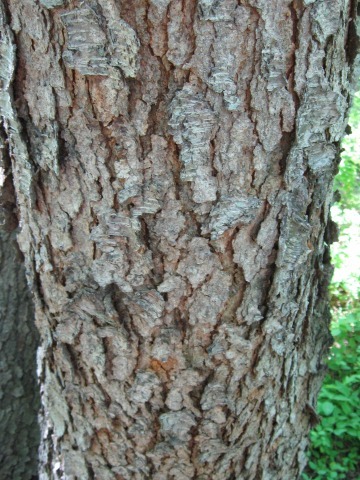 The young bark and roots have a distinctive smell when cut. What is this small shrub with small red berries, and lanceolate, alternate entire leaves? Can anyone identify this plant/weed that has a curled-over top with little white flowers? What is this small annual with narrow gray/green leaves and rust colored daisy-type flowers? What is this small shrub with variegated glossy ovate leaves? What tree is this with red berries?